Promo Planter Packaging Design Options :	You may select one of the 5 Package Design Options; "Stock" will be used if Packaging Design is not specified. 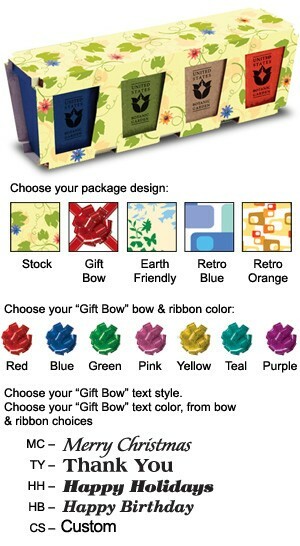 Choose from: Stock, Gift Bow (with your choice of bow color), Earth Friendly, Retro Blue, Retro Orange. Instructions are printed on the back panel of the packaging. The "Gift Bow" Package Design imprintable area is 5-1/4"W x 1-1/2"H. Choose your "Gift Bow" bow & ribbon color, text style, & text color. CUSTOM Package Design: Client submitted art on our template (see "Download Template"); no charge. AAkron custom design; $45.00 (G), includes a free e-proof. Shipping Weight :	Approx. 45 lbs. per 100 pcs.